Adds magic imbued arrows that can be crafted at smithing forges. Each arrow has their own unique effects and properties, giving archers more variety in playing styles. 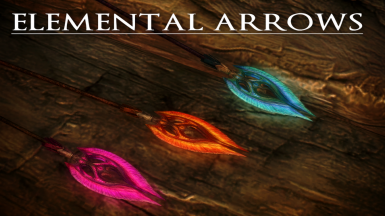 Elemental Arrows - Turkish Translation Bu Mod Olmadan Çalışmaz!!!!!! Quick fix for Thunderbolt Arrows appearing in large bundles on leveled lists. Fixed arrows not showing on the smithing forge. They now show up under IRON. Archery is one of the play styles in Skyrim that I find more interesting than the others. Swinging a sword, hammering an axe, or shooting fire out of your hands is nothing compared to the feeling of nocking an arrow into you bow, pull, take aim, and unleashing death from a distance as you see your carefully prepared shot take down its target. 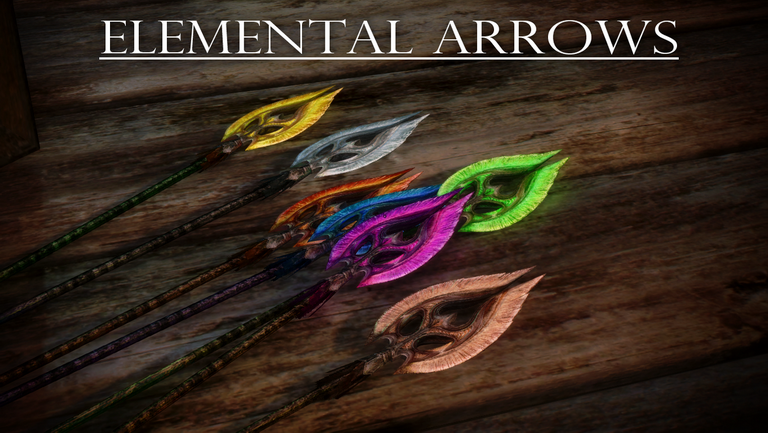 Elemental Arrows is a mod that adds magic imbued arrows that can be crafted at smithing forges. Each arrow has their own unique effects and properties, giving archers more variety in playing styles. Especially if you're an archer that doesn't want to spend time maxing Enchanting to get most out of Archery. 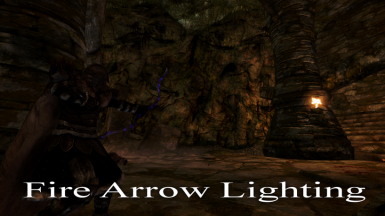 There are already several mods that add "magical arrows" into the game, however I felt that most of them were either overpowered, didn't scale well, too hard to access for practical playing, or were plain outdated (after not being updated for so long). 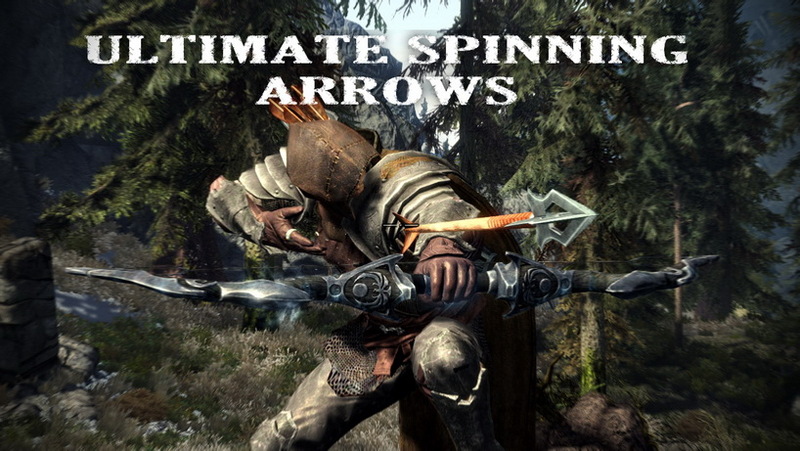 This mod also includes the spinning arrow meshes from my other mod, Ultimate Spinning Arrows. Arrows will also emit light during flight, making it easier to see where your shot lands. 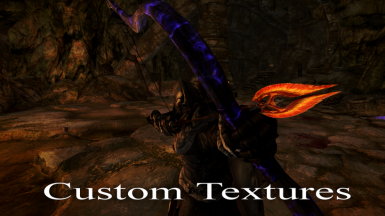 The arrows are given custom textures to differentiate them from other arrows. 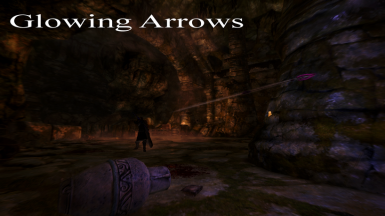 The arrows have been carefully tweaked with appropriate and fitting visual effects to properly reflect their use during gameplay. Thanks for the video Brodual! The requirement to craft all these arrows is a minimum Alchemy skill level of 25, and the Arcane Blacksmith perk. Crafting is done on a smithing forge. All these arrows require Gem Arrows as the base ingredient for crafting them. 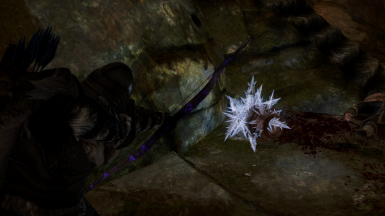 These arrows may also be found on merchants, blacksmiths, and random loot. Some high leveled undead and Thalmor may also carry them. However, the magic arrows are very rare to find, and they usually come in low quantities, due to the scarcity of the required ingredients to craft them. Base ingredient for crafting magic arrows. Craftable, but also found randomly on merchants and blacksmiths. Arrows crafted using less known elven magic smithing techniques, by imbuing the arrowhead with a mixture of magical ingredients to create magical arrows. The lesser known fact is that the actual magics lie in the fletch itself, as you can see the magics being released as the archer shoots the arrow from his bow. The arrowhead instead contains the ingredients which are released upon impact. That is when the magicka from the fletch "ignites" the arrowhead, creating a chain reaction that will manifest the desired effects depending on the ingredients used to create these arrows. Arrows made using ancient Dwemer knowledge of manipulating magicka and Dwarven smithing techniques. 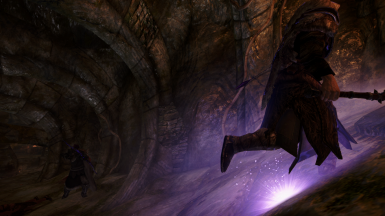 These arrows are not made merely by smithing prowess or arcane mastery, but through countless experiments and research with Dwemer science and technology. Unlike magical arrows made by elvenfolk, these arrows contain compressed magicka contained within a core, embedded in each arrowhead. Throughout the years, some Dwarven archers shared knowledge of the creation of these arrows with fellow archers throughout their travels. Today, this knowledge is no longer a secret to adamant archers everywhere, but only a few have the skill to craft them. The arrow releases whatever magic it was imbued with on impact. The explosion itself actually has an area of effect, depending on the arrow. So you can aim at the floor or wall, and there's a good chance that whoever is close enough takes damage. This mod requires the Dawnguard and Dragonborn DLC. Installation can be done via any mod manager like Wrye Bash, Mod Organizer, or Nexus Mod Manager. Manual installation is done by manually extracting the files to the appropriate folders. Remove all the files to uninstall this mod. 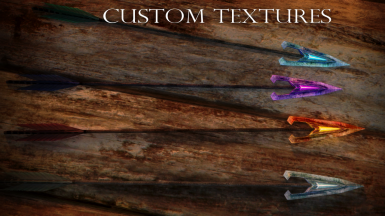 This mod uses its own meshes and textures. 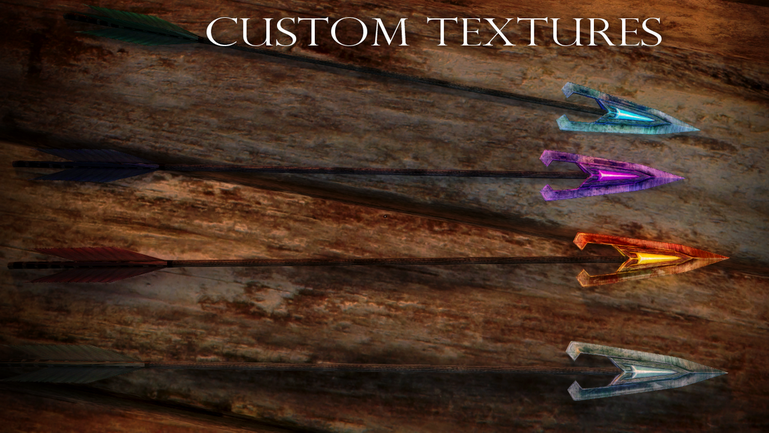 It only used vanilla meshes for the quivers, the textures will change depending which texture replacers you install. This mod also won't be affected by mods that changes vanilla arrows. You can place this mod anywhere on the load order. This mod will not conflict with any other mod. Headshots doesn't work a few arrows. Currently working on fixing this.